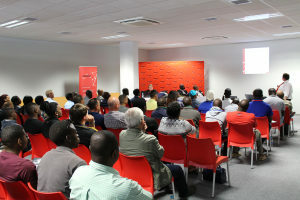 Over 50 prospective suppliers and upcoming entrepreneurs from Erongo region and from as far as Otjiwarongo attended Erongo RED’s first ever procurement information session which was held on Friday, 08 May 2015 at its Head Office in Walvis Bay. The purpose of the information session was to educate and inform the public especially the ones in the business sector about the company’s procurement policies and procedures. Information presented include among others, sourcing of quotations, purchase orders, tender procedures, SME and BEE price preferences, bribery and corruption and upcoming projects. Erongo RED adopted a new centralized procurement process where the procurement department is now responsible for obtaining quotations from various suppliers. The new procurement policy is part of the company’s ongoing drive to streamline internal processes to be responsive to the needs of the industry and their customers. The new policy allows small and medium enterprises to participate in the procurement process at the company. Through the new procurement policy the company aims to create opportunities for local companies to compete fairly. Thus, it is necessary to furnish potential suppliers and entrepreneurs with information regarding of what is actually required of them when they see Erongo RED’s tenders in the newspapers. Speaking at the same event, Executive Manager, Freddie Vries said “Erongo RED view suppliers as valued assets and extension of our own business. It is therefore imperative that we share the same goals. The quality, price and service that we provide to customers can only be as good as what receive from our suppliers. We strive for continuous improvement in these three critical areas and seek to establish relationships with suppliers that are equally passionate in their quest for better quality, price and service”. Although the new policy is robust and responsive, the Procumbent Officer, Annalene Welgemoed highlighted the importance to adhering to the procurement procedures. “Adhering to the procurement procedures is a crucial in maintaining transparency, accountability, impartiality and fairness in the procurement process. It helps to prevent corruption issues, such as suppliers bribing those in charge of the procurement process, the fixing of bid prices or the awarding of contracts to one supplier without competitive bidding. It also helps ensure that right goods or services are procured from right supplier with good track records at the right price,” said Welgemoed.